Another 1/2 inch in the rain gauge at 5:30 this morning, and it’s still coming down at 8, so I told the crew, or most of the crew, no work this morning because it is too wet. The weeds are having a head start on most crops because we cannot get to them. It seems each time we get a start on one of the places with weeding it rains. We are saturated. We still have an acre and a half unplanted. That is the latest we have had so much open ground unplanted. This may be a problem in the mid season. Our daughter Adrienne is home for a week between the end of the spring semester, the beginning of the summer semester, and her swimming lessons / coaching job in Grand Rapids, so she is filling in for Janna this week in Sioux City. We continue to look forward to a stretch of warm sunny weather. The cucumbers are planted, the tomatoes are on up the strings in the high tunnels, the potatoes have been weeded twice (but they need hilling), and we continue to start new plants in the greenhouse, usually each Wednesday afternoon. We call that our Wednesday seeding. The garlic is yellow, well, green turning yellow prematurely. I need to check if it’s yellow asters. That was a problem several years ago in Minnesota, and then we didn’t grow garlic for 2 years. I hope it’s just too much moisture and it clears up. In the morning it feels like spring the last two days, but then by late afternoon when we are really rolling, the students come out to work, and boom it is dark. Then you know it’s almost all over! This time SIOUX CITY we would like to meet at the market location BUT at 4 to 6 pm. We did this last year too in November because the market season is over, we have no other reason to be there during the day time. IF you can not pick up your box between 4 and 6 pm tomorrow please contact John 712-490-8218 and we can work something out. Hopefully most folks can swing by on their way home. Sioux Center we will be at the regular spot and for the regular time, I will bring some extra carrots, potatoes, sweet potatoes, squash for passersby or your friends that don’t participate in our CSA yet! Spencer, Barb is coming to the farm at 1:30 Wednesday so I anticipate that your shares will be at the salon by 3 pm. I am sure she will let everyone know via Facebook. Next time will be November 18. I began work on building a new high tunnel yesterday to increase our early and late season capacity. It is a small one. It fits between the greenhouse (heated for starting plants) and the old hog house. It is important to me to get the ground posts in before frost. Once they are in, the ground can freeze up, and we can continue framing. We will likely not put film or plastic on until a warm day in the spring. I’d like a 70 degree day for finishing it so it’s snug. We have a large amount of sweet potatoes and carrots available. We have some potatoes, squash and cabbage too for storage. We are out of pork cuts and chicken ’til spring. This week we are selling Ham from Berkshire pigs sliced, 5# hams slices are 1/2 inch thick, we have a limited number, its first come first served, great for Thanksgiving or Christmas. $30 each. Beginning this week we also have boxes of Carola potatoes, a potato in your box this week that stores very well. We have boxes 30, 40 or 50 pounds. $1.25 a pound. These were grown from organic seed potatoes, no fungicide etc. We also have boxes of sweet potatoes to go the same way. Carrots are one of my favorite vegetables. I wish the cooks here prepared cooked carrots more often! We have carrots, and will have carrots. 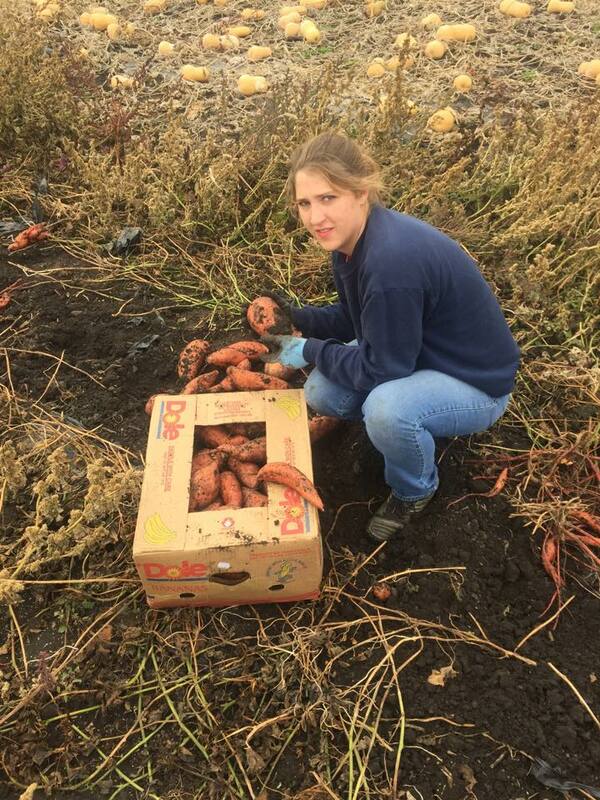 Look for boxes of carrots towards Thanksgiving, I have dug carrots on Thanksgiving day regularly so I stay out of the kitchen, and out of the way. This weeks lettuce was grown outdoors, with the dry windy weather the open lettuces make great receptacles for tree seeds. please clean carefully! The dirty black sphere in your box is a radish, wash, eat with caution. It is a called NeroTondo. Janna will be in Sioux City, John In Sioux Center till 12ish.